As Hurley told about 50 parents at a presentation at the Waldorf School last month, sexual abuse is very prevalent and happens to kids of all backgrounds — including the children of very competent and conscientious parents. According to Hurley, one in four girls and one in six boys are sexually abused by the time they’re 18. “We can’t prevent child sexual abuse any more than we can prevent car accidents,” Hurley said. She aims to convince parents that it could happen to their own child, and therefore they need to have ongoing conversations with their kids that give them the tools to identify inappropriate interactions and to feel comfortable telling their parents if they experience any such interactions. Through her two-hour presentation, “Ten Tips Every Parent Should Know to Protect Your Child from Sexual Abuse,” Hurley provides parents with effective language and strategies for having those conversations. She has developed two versions of the presentation—the one she presented last month, focused on how to talk with young children, and one focused on how to talk with your teen children about consenting sexual relationships. 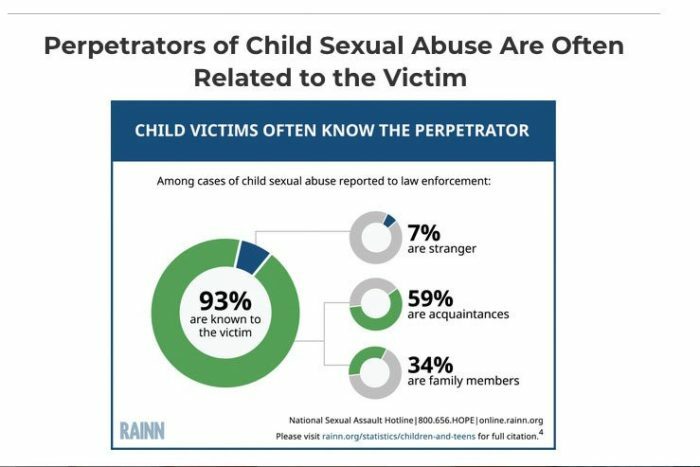 Hurley began her presentation explaining that parents often talk to their children about “stranger danger.” They may warn their children, “Never get into the car of a stranger.” However, she noted, less than 10 percent of child sexual abuse victims are abused by a stranger. While we need to teach our children to beware of strangers, Hurley explained, parents need to know that child sexual abuse is typically committed by someone the family knows and trusts — such as family members, friends, or caretakers – and happens within the home of the victim or perpetrator. Offenders don’t want to scare their victims, they want to befriend them. Most perpetrators want frequent access to their victims, so they will purposely develop trusting relationships with the families. Once they have a trusting relationship, the child will be less likely to identify any part of their interactions as inappropriate and less likely to tell their parents about something that doesn’t feel right. Also, parents will be less likely to believe their child. Perpetrators typically “groom” a child first. They often identify something a child desires or needs — such as more attention —and make it a point to fill that need. They may use games to desensitize the child to the abuse, talk with the child about keeping that part of their relationship a secret, or manipulate the child into thinking that telling their parents would upset them. Parents need to teach their children the real names of their private parts, Hurley told the parents, and explain that it’s not OK for anyone else to touch their private parts, talk about private parts, show them their private parts, or show them pictures of private parts. And if anyone does “break these rules,” we want them to tell us about it. One thing that keeps kids from talking to parents about sexual abuse is a sense of shame. If kids have no words to talk about something that they’re experiencing, they’re more likely to think that it’s something they shouldn’t talk about with their parents. Child victims often simply hope the abuse will stop. And when it doesn’t, they think their parents will be mad at them for not telling them earlier. The impact that sexual abuse has on a child, according to Hurley, has much more to do with the how the child and adults respond to the situation than the extent of the abuse itself. As a licensed social worker who has worked with child sexual abuse survivors for the past 15 years, she shared stories about children’s ability to “bounce back” from traumatic experiences. When a child tells their parent about the abuse, and when the parent praises the child for coming forward with the information, reports it to the police, and reaches out to a place like River Bridge that provides services for children who have been sexually abused, children can be incredibly resilient.